Netlify supports both incoming and outgoing Webhooks. Incoming webhooks notify our servers to do something. Outgoing webhooks request another service to do something when events happen with your sites. The only supported action for incoming webhooks right now is to trigger new builds and deploys. These webhooks are often referred to as build hooks. You can find them in your site dashboard at Settings > Build & deploy > Continuous deployment > Build hooks. Select Add build hook to create a new build hook. The build hook name is for your reference, and will display in your list of build hooks, as well as in the default deploy message for each deploy triggered by the hook. Select a branch to build by default. Only branches which have been deployed at least once will appear in this list. Upon saving your build hook settings, Netlify will give you a unique URL for that webhook. To trigger this hook, you need to send a POST request to that URL. You can also test webhook requests with tools like API Tester or Postman. trigger_branch: Specify which repository branch the build will use. If the branch does not exist in your repository at the time of the build, the build will fail, with an error message in the build log. trigger_title: Specify a title to replace the default deploy message in your site deploy list. This would trigger a deploy from an existing branch called testing, with a custom message: triggered by This Awesome Service. You can send a custom payload in your build hook POST request. The contents must be passed as a string, which will be URL-encoded and made available in the triggered build as an environment variable. You can access it in the build by using the variable INCOMING_HOOK_BODY. Outgoing webhooks are useful to notify other services when something happens with your site in Netlify. 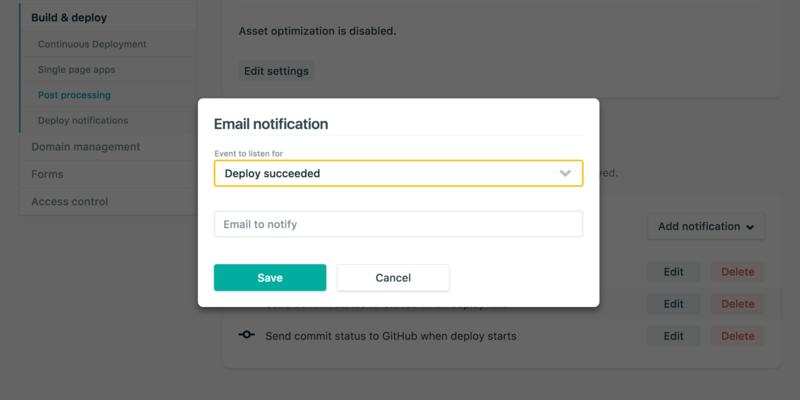 Deploy started: this event is emitted when Netlify starts building your site for a new deploy. Deploy succeeded: this event is emitted when Netlify finishes propagating a new deploy in our CDN. Deploy failed: this event is emitted when the deploy failed to complete. Deploy locked: this event is emitted when a deploy is locking a site. Deploy unlocked: this event is emitted when a deploy stops locking a site. New form submission: this event is emitted when someone submits new form information in your site. Select the type of notification you want to create and add the required configuration. This feature may not be available on all plans. This webhook allows you to send event information to an arbitrary URL using a POST request. The body of the outgoing webhook request will have a JSON representation of the object relevant to the event. If you provide a JWS secret token for URL notifications, Netlify will generate a JSON Web Signature(JWS) and send it along with the notification in the request header X-Webhook-Signature. This webhook allows you to send event information to an email address of your choice. This webhook allows you to send messages to a Slack channel when Netlify emits events. 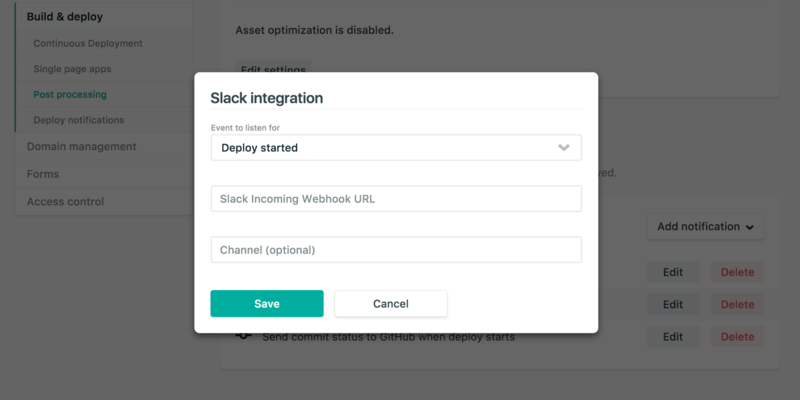 Before configuring this notification, make sure you read Slack’s documentation on incoming webhooks. 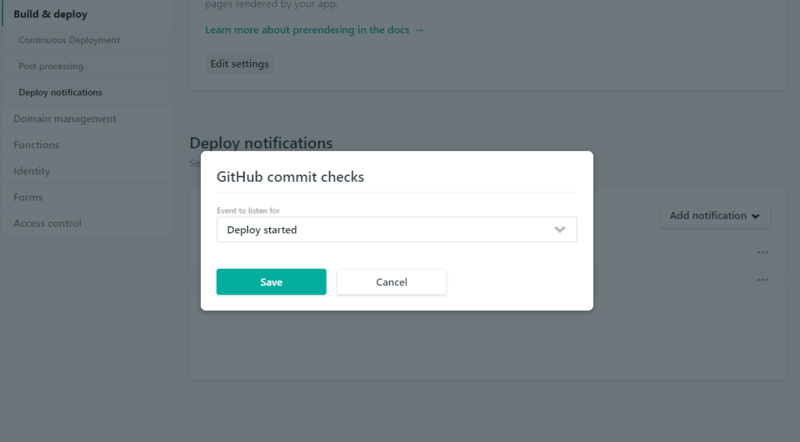 This webhook sets commit status notification and link to a deploy preview directly in your GitHub pull requests and commit lists. These notifications are added to all new GitHub-connected Netlify sites by default. 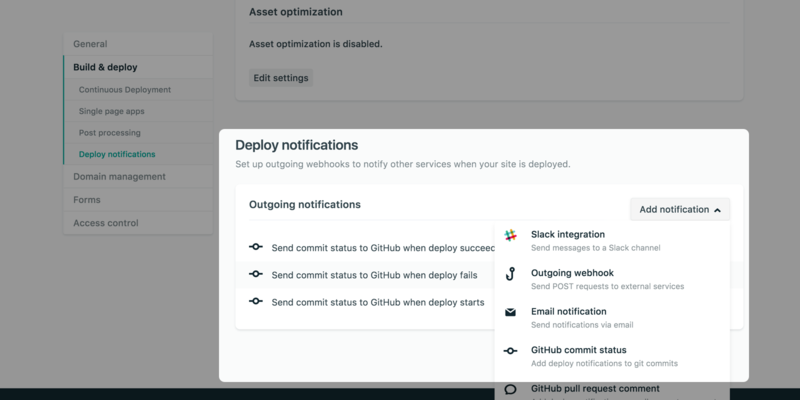 You can add, remove, or edit them from the site dashboard at Settings > Build & deploy > Deploy notifications. The settings include a field for a custom message, which will replace the “Deploy preview ready!” message that displays by default. This webhook adds rich deploy information from your deploy summary to your GitHub pull requests and commit lists. This includes more detailed information in the Checks tab of your pull requests on GitHub. 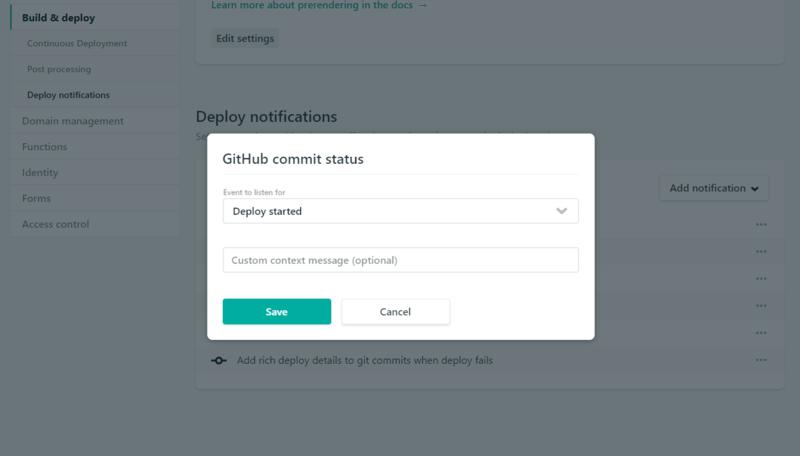 If you don’t see the option for GitHub commit checks in the Add notification dropdown, you will need to configure your site to use the Netlify GitHub App. 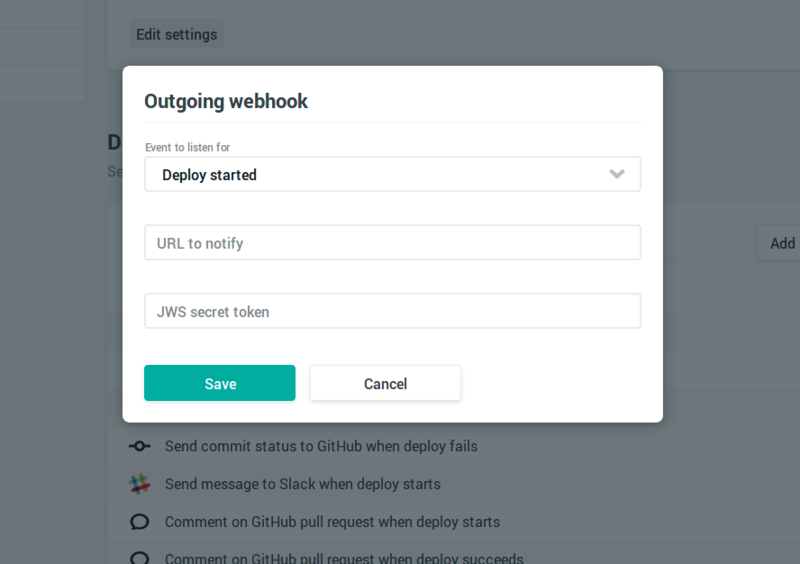 This webhook adds a comment to your GitHub Pull Requests, notifying the status of the associated deploy, and a link to the deploy preview when ready. It also updates that same comment if you append several commits to the same pull request. You can add a GitHub pull request comment notification from the site dashboard at Settings > Build & deploy > Deploy notifications. 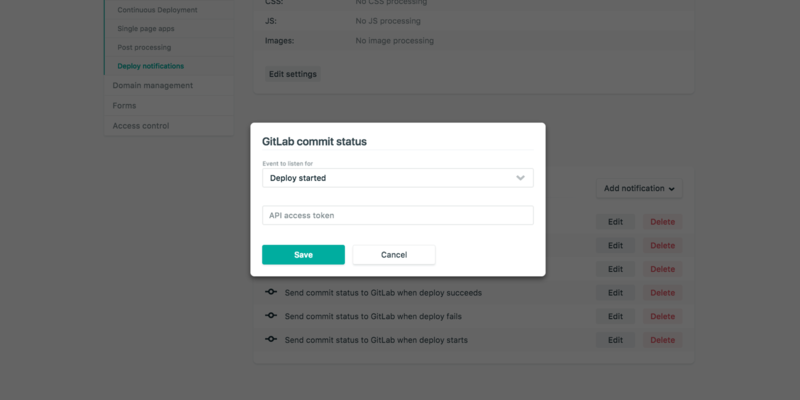 This webhook creates commit statuses in your GitLab repositories. This webhook adds a comment notification in your GitLab merge requests. It also updates that same comment if you append several commits to the same merge request. Bitbucket notifications are not available because Bitbucket’s API functionality does not support Deploy Previews.